The Internet of Things is coming, and the internet operated cameras are becoming all too common. The Samsung SmartCam is Samsung’s offering to this market, and this camera features Wifi Connectivity, apps on both Android and Apple devices, a built in microphone and speaker to have two way conversations (kind of like walkie talkies, but more on that later), and has the ability to see in the dark thanks to Infra Red technology. The camera has the same look and feel as most Samsung products, i.e., clean, smooth, and somehow looking very normal. 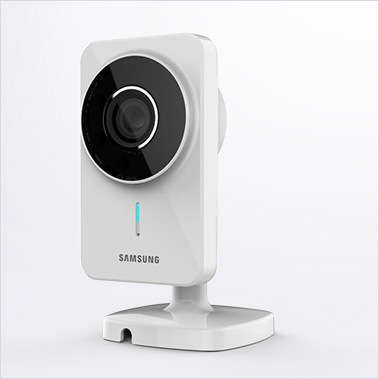 The front features a camera, an LED indication and the proud Samsung logo. The back features a power input, a port to connect this to your Ethernet/Router/LAN and a button which helps you set up the Wifi network on this. The camera sits on an adjustable base, and supplied with the camera are both screws as well as double sided tape to allow you to mount this in various locations. The base features a removable bracket to ease this. Thanks to the swivel motion of the adjustable base, this can be mounted and turned to face in almost any angle. 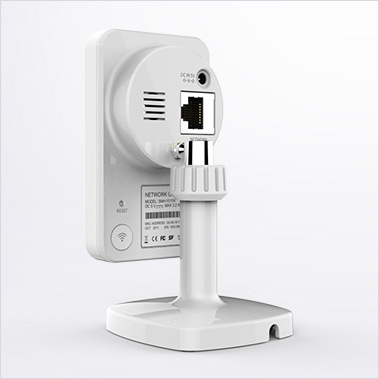 There are two ways to use this, via a wired internet connection (LAN) or a WiFi. These days it is only natural to use such a product via WiFi, so that is what we used. The Quick Start Guide, included with the camera gives you two options. The second option points you to your computer’s web browser, where you set up an account, and when it comes to connecting the camera, it only gives you the option of a wired camera setup. No WiFi, and that is as far as we went. But wait, there was option no. 1, which was downloading the Samsung SmartCam app, free on both Google and Apple’s stores. Once downloaded, you go through the account setup process again. Once done, you can then connect your camera. You have to push the WiFi direct button at the back till the LED changes colour, at this moment in time, your phone (or tablet) will disconnect from the WiFi it was using, and connect to the camera using WiFi direct technology. WiFi direct is a bit like Bluetooth, as in it allows you a Peer-to-Peer connection. Once detected, your camera (or cameras) will appear in a list, and you choose the one you are setting up based on its serial number. After that, you will get a list of available WiFi networks, you choose your own one, enter your password, and off you go. We had to repeat the last step twice, but we are happy to discount this. Once setup, you don’t have to do anything else. The camera is connected to your internet, and available to be accessed via the apps or the internet. Next time the camera powers on, it should automatically pick up the WiFi connection, though it can take a little while (up to five minutes!). You know it is connected once the LED goes green. Once setup, you can use both a browser on your internet connected computer, or an app on your Android or Apple device to view whatever is going on in front of the camera. But what if it is dark? Oh, the joy of these cameras these days (the few we have tried) is that they come with built in night vision goggles. You get a black and white image, but it is good enough to give you what you want. While internet and all it offers is blazing fast, there will always be some kind of a delay. We found the delay to be about 2 seconds, and that is a function of our internet speed, our devices speed, etc. On top of that, you can set alerts for any motion detection or audio detection. These can then either be pushed to your device, or even better, 30 second video clips can be recorded and uploaded to your YouTube account as private videos, so you can view them later for every event. Since it records audio as well, it can record sound for these clips too! You can also set it up to monitor events at certain times, for example when you’re not home, or when you’re not at your office. Both motion and audio detection work very well, and we can’t find fault with it. Such events are time logged, and can be seen via the app or the website. Something this camera gives which we haven’t seen much of is the ability to have conversations using this camera. Now before I go on about how cool it is, do remember the lag factor I have mentioned above. Anyway, the two way conversation is only available via the app, and not via your browser. To speak, you have to press and hold a microphone button, which transmits your sound, but it is full duplex, so you won’t lose any sound coming from your microphone in case something is said while you are speaking. In this regard, it is a bit like a walkie talkie, but not quite. This can be particularly useful if you use this as a baby monitor. Or to freak out any intruders. Or your cat. An all in one product, and not too shabby. We wish that the setup process was easier, but it is a one time pain, and if instructions are followed exactly, it kinda works, so it isn’t too bad. We particularly like the feature that allows us to talk to people. Next story Hexbugs are ready for Easter! worst webcam I have ever used .. dumbs down my smart home. back to the store for a refund!